Hmmm, the iPad seems to have taken on yet another role – that of a game board. Now that is certainly interesting, as the Yoomi Duo Board Game from Toys “R” Us will rely on the iPad (it doesn’t matter whether you have the Wi-Fi only model or the one with 3G connectivity) as a game board. 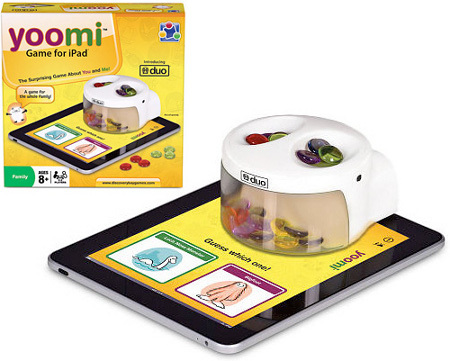 The Yoomi comes with an accessory which is attached to the iPad’s dock port, partly resting on the screen, and it will take the real deal to figure out how this magical combination works to provide hours of fun and activity within your family. Not only that, since the iPad is extremely portable, it is also travel friendly and can be used to alleviate boredom, coming in handy especially when waiting in transit for flights. It is currently going for $39.99 on the Toys “R” Us website if you’re interested. travel friendly indeed, that’s a good selling point. cause extra equipment that includes 50 small beads will never get lost or misplaced. They’ll all be using pennies and old marbles within a month. And this really does solve the deficient function of ipads being able to keep score. Now we need an ipad, this piece of junk and a pad of paper to remember what the score is. Wouldn’t kids just rather see a really cool animation when it calculates the score, rather than a 40 dollar piece of garbage that will definitely get broken / lost / both? My kids love this thing. That Poto is a negative nancy. Yes, the iPad could probably handle score keeping just fine. But there’s something awesome about having a physical, tactile, “magical” device that moves and drops the beads in when you hit a button on the iPad. Snarky, negative, tech-saavy hipster geeks may not be impressed, but my kids and their friends love it. Plus, the yoomii game is really cute and fun and makes all the kids giggle when they each try to guess the choices they each can make. Must buy for parents and even non-parents who just want a fun gadget and cute game to play with friends.